Hives is a common skin problem that can affect any individual. In medical terms, it is referred to as Urticaria. It leads to uncomfortable, itchy, red rashes or bumps on the skin. They can vary in shape and size. Any part of the body like arms, legs, face, throat etc can develop Hives. Depending on the duration of Hives, they can be classified as acute or chronic. Acute Hives usually last up to six weeks or less whereas Chronic Hives last for more than six weeks. Most cases of Acute Hives are associated with allergies. The chronic form of this disease is often associated with autoimmune diseases. Chronic Hives can occur from time to time and last for longer periods of time. This ailment usually heals by itself. Still, many natural home remedies for Hives have been found extremely useful in facilitating the healing process and preventing its occurrence in the future. Allergies caused by certain foods, medicines or insect stings are the most common causes of Hives. Common food allergies are related to foods like milk, strawberries, eggs, nuts etc. Viral illness, infections, temperature extremes, pressure, water, sunlight and stress also contribute in causing this disease. There are times when the exact reason causing this disease is not clear. Such cases (generally in chronic Hives) are known as Idiopathic Urticaria and are often linked with hereditary factors. Apart from these factors, Hives can be triggered by metabolic, liver, kidney or blood diseases. Hives often resemble mosquito bites in appearance. These welts are itchy, painful and red or pink colored. At times, Hives may be accompanied by deeper swellings known as Angioedema. Angioedema generally leads to swelling near the eyes and mouth. Such swellings are usually painful but do not itch. Severe cases may be characterized by difficulty in breathing, difficulty in swallowing, irregular heartbeat, anxiety, dizziness or loss of consciousness. • Mix two cups of oatmeal and about three tablespoons of cornstarch. Applying this mixture on the affected area for about 20 minutes or half an hour is one of the most popular home remedies for Hives treatment. • Mix half a cup of cornstarch and the same amount of baking soda in half a tub of lukewarm water and regularly soak the body in this mixture to cure Hives and its symptoms. • Simply boiling some water and adding one tablespoon of oatmeal in it also acts as an effective natural cure. Strain the mixture and apply on the Hive affected area to heal Hives. • Taking cayenne pepper capsules is highly recommended home remedy for treating Hives naturally. • Applying a mixture of rose water and vinegar is beneficial in the treatment of Hives related itching. • Aloe vera gel is one of the most widely used natural home remedies for Hives. Vitamin E oil is equally beneficial. • Add a few drops of grapefruit seed extract in a teaspoon of olive oil. 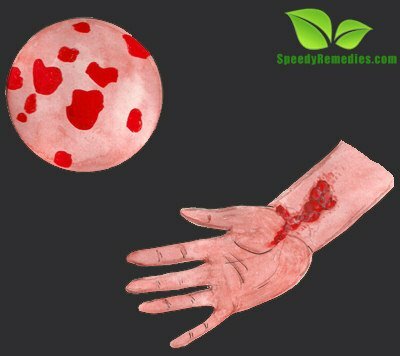 Applying this mixture on the affected area is a simple home remedy to get rid of Hives. Grapefruit seed extract can also be mixed in water and applied on the affected area for relieving Hives and the related itchiness. • Drinking nettle tea is considered as one of the most effective natural home remedies for Hives. Honey or lemon can also be added in this tea to make it more effective. • Therapeutic herbal teas like that of chamomile, peppermint, passion flower and catnip are excellent natural home remedies for Hives caused by stress. • Swimming in a pool with chlorine added in its water serves as a good natural remdy in dealing with Hives. • Take three-fourth cup of vinegar, one-fourth cup of brown sugar, one tablespoon of ginger. Add some water to these ingredients and boil the mixture. Apply this mixture on the affected area at regular intervals to reduce Hives. • A poultice prepared from crushed chickweed leaves, peppermint, beeswax and almond oil is a good natural remedy for this ailment. • Drinking some milk or water mixed with turmeric is valuable in preventing and curing the Hives. • Acupressure has also been found useful in curing Hives. • Applying cool compresses and taking cool showers help in getting rid of Hives related itching. A healthy and balanced diet goes a long way in curing and preventing Hives. Foods rich in vitamin C, vitamin E and zinc should be positively included in the diet to reduce this problem and aid in faster recovery. Fruits like apples oranges, peaches, grapes, pineapples and papaya are highly beneficial in this regard. Needless to mention, foods that cause allergies should be avoided as much as possible. Besides, restrict the consumption of alcoholic and caffeinated beverages as they tend to aggravate the problem. Similarly, fermented milk products, white sugar, meat, poultry and processed foods are also best avoided. My problem is with hives.They are on my face and stomach and I’d like to know how I can find out where they come from and how to deal with them.Please help me if you can.I have candida also.If you can call me sometime,I need to talk to a person who knows something about these issues.I am going out of my mind over this.My number is 856-430-0701.If you can shed some light on this please help me.No allergist knows anything. I felt an itch on the back of my neck then it spreaded onto the back and I went to the doctor and she said it doesn’t look good but she recommended it that I take pills and calamine lotion to heal the rash but for some reason the itch keeps coming back and I’m trying to resist the itch but I can’t, and now I’m trying petroleum jelly with vitamin E, and I’m going back to the doctor on Monday to see if its gone, if it works then I’ll be fine but if it doesn’t work then I’ll have to see a dermatologist, what should I do even though I’m trying a little bit of home remedies to make sure it’s gone for good and I’m also eating more healthier.